Patches of Hope Quilt Ministry’s purpose is to reach out to people and provide a sense of hope, comfort and love, as we spread the good news of Jesus. Our goal is to reach out to people in our church and community who are in the midst of a serious illness with the gift of a quilt. Our prayer is that our quilts will become a physical, touchable expression of care and concern that can be very important to the recipient in need. The members of the Quilting Ministry have cheerfully worked to create these beautiful quilts that provide care, comfort, and encouragement to the hurting. If you know how to sew, great! If you have made quilts before, great! We would love to have you and your experience. We also want those who think they can’t sew. 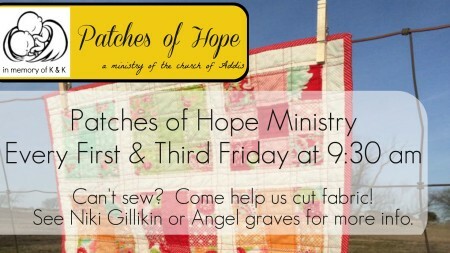 If you have never touched a needle, thread, or sewing machine, but would like to join in … we want you! And yes, we have sewing machines for you to use. If you don’t want to sew but want to help with other tasks, fabric donations must be sorted and organized, scraps can be cut into usable pieces, kits can be prepared. Or, perhaps you are a dedicated bargain hunter, haunting yard sales and thrift stores. These are always good places to find quilting tools and supplies. Bring us your skill and we’ll find a way to use it! To join us contact one of our ministry leaders. We meet every first and third Friday at 9:30 AM in the kitchen.